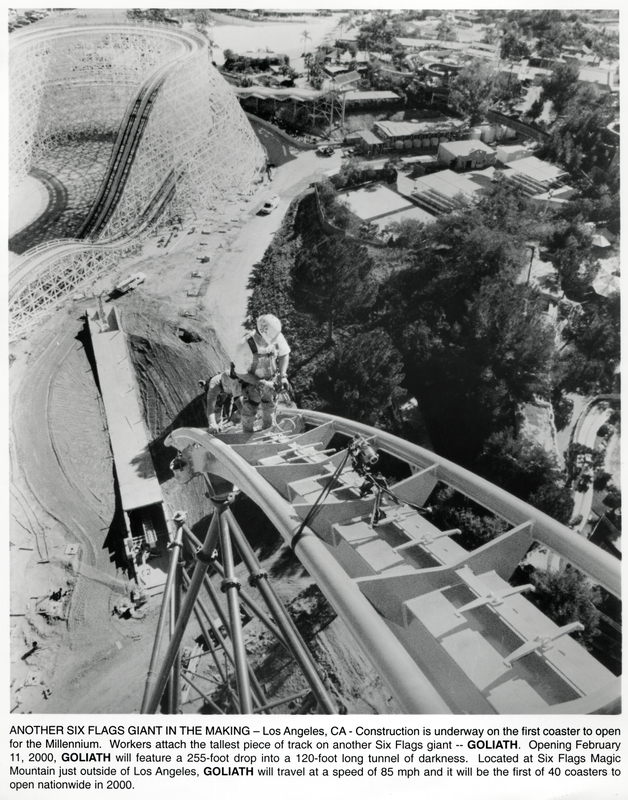 "Another Six Flags Giant in the Making — Los Angeles, CA — Construction is underway on the first coaster to open for the Millennium. Workers attach the tallest iece of track on another Six Flags giant — Goliath. Opening February 11, 2000, Goliath will feature a 255-foot drop into a 120-foot-long tunnel of darkness. Located at Six Flags Magic Mountain just outside of Los Angeles, Goliath will travel at a speed of 85 mph and it will be the first of 40 coasters to open nationwide in 2000." LW2567: 19200 dpi jpeg from original 8x10-inch photograph.